We specialize in the remodeling and renovation of Dallas area pools. From simple cosmetic updates to large scale structural renovations, our skilled professionals transform the look and feel of custom swimming pools throughout the North Dallas area to better meet homeowners’ needs and style preferences. 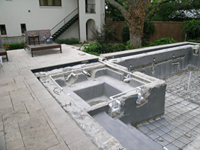 If your old pool has lost its lustre, contact our pool remodeling and renovation experts today. We’ll meet with you at your home to assess your needs and get a sense of your personal style. Together we’ll create a poolscape that reflects the beauty of your home and the lifestyles of those who live in it. Often times, a customer needs help deciding what the end result will look like before feeling comfortable with the renovation process. We work with several Landscape Architects & designers that can help with the entire process.